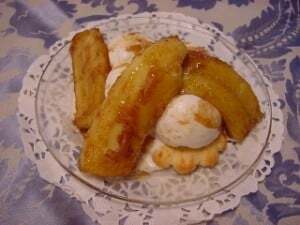 Banana Foster was originally created by Brennan’s, and it is hard to make this recipe any better. Butter, caramelized bananas, cinnamon, nutmeg, and different types of liqueur make this a true delight. Don’t miss out on this classic dessert from Brennans. This ice cream treat is easier than you think it is to make. You don't need to be in New Orleans to enjoy Brennen's Famous Banana Foster, you can make it at home. Combine the butter, sugar, and cinnamon in a flambé pan or skillet. Place the pan over low heat either on an alcohol burner or on top of the stove, and cook, stirring, until the sugar dissolves. Stir in the banana liqueur, then place the bananas in the pan. When the banana sections soften and begin to brown, carefully add the rum. Continue to cook the sauce until the rum is hot, then tip the pan slightly to ignite the rum. When the flames subside, lift the bananas out of the pan and place four pieces over each portion of ice cream. Generously spoon warm sauce over the top of the ice cream and serve immediately. Wow, only 1 to 2 pats of butter. I am glad the waiters in Houston use a little more 😉 Good to know about the flourish! If you haven’t been there, they shake a little cinnamon into the flame so everyone can watch it spark. is a absolute must. Please try to Banana Foster. The Mint Julep wasn’t my thing. The atmosphere was perfect. Go during the winter months. mmm. yummy. this is making me hungry.